33-year old power forward Brandon Brown (201-PF-85) had a great game in the last round for KCC Egis and receives a Interperformances Player of the Week award for round 29. 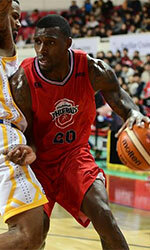 He had a double-double of 39 points and 15 rebounds, while his team edged out Anyang KGC (#8, 17-22) 109-106. 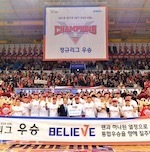 KCC Egis maintains the 5th position in South Korean league. KCC Egis is a typical solid league team placed somewhere in the middle or a little bit lower in the standings. They need more victories to improve their 20-19 record. In the team's last game Brown had a remarkable 55.0% from 2-point range. He turned to be KCC Egis' top player in his first season with the team. Cal State - San Bernardino graduate has very impressive stats this year. 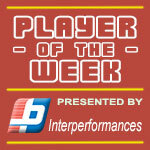 Brown is in league's top in points (4th best: 25.4ppg), rebounds (6th best: 13.0rpg) and averages solid 59.7% FGP. Worth to mention Brown played also at Eurobasket Summer League, which helped him get the job in pro basketball. Second best performed player last round was Aaron Haynes (201-F-81) of SK Knights. He is American forward in his second season at SK Knights. In the last game Haynes recorded impressive double-double of 31 points and 18 rebounds. It was enough for SK Knights to edge the higher-ranked KCC Egis (#5, 20-19) by 4 points 90-86. SK Knights' 9th position in the standings has not changed. His team is not often considered as one of the league's best with a mere 12-26 record. Haynes is well-known at SK Knights and he already established his position as one of the team's leaders. He belongs to the best scorers in the league with 20.9ppg (#9). His other stats are also decent: 10.8rpg and 4.9apg. Third place about best performers goes to forward James Mays (205-F/C-86) of LG Sakers (#4). Mays got into 30-points club by scoring 34 points in the last round. He went also for ten rebounds . He was a key player of LG Sakers, leading his team to a 110-105 win against the lower-ranked DB Promy (#7, 18-20). LG Sakers needs these victories very badly if they think about getting closer to top teams. Their record at this point is 20 victories and 18 lost games. Mays has a great season in South Korea. After 38 games, he made it on the list of the league's leaders in points with 26.4ppg (2nd best) and rebounds with 13.3rpg (4th best).